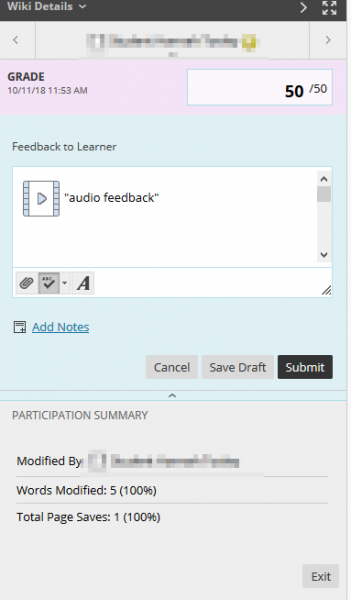 How do I leave video/audio feedback on student submissions? Blackboard has a new feature where instructors can leave video and/or audio feedback on Assignments, Discussion Posts, Blogs, Journals, Wikis, and Tests. Students can then listen/view instructor feedback from their "My Grades" section. 1. Open the assignment you need to grade from "Needs Grading" or the "Full Grade Center". 2. 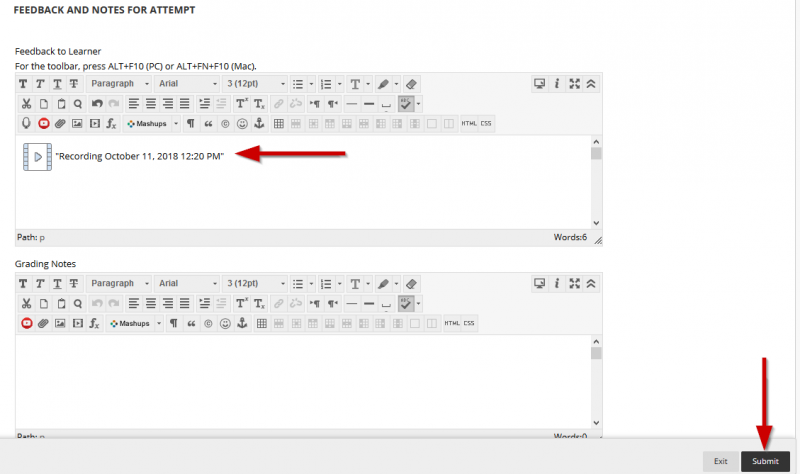 Then, click on the capital “A” icon to “Open the full content editor”. 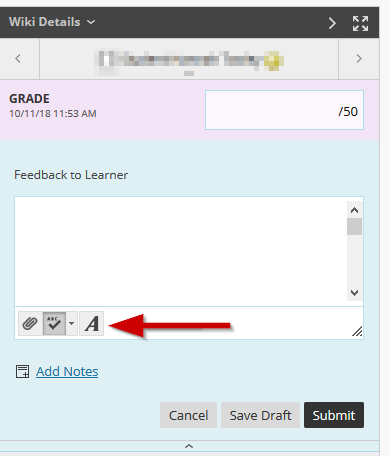 Note: If you do not see the blue "Feedback to Learner" box, click on the blue bar beneath the grade. 3. 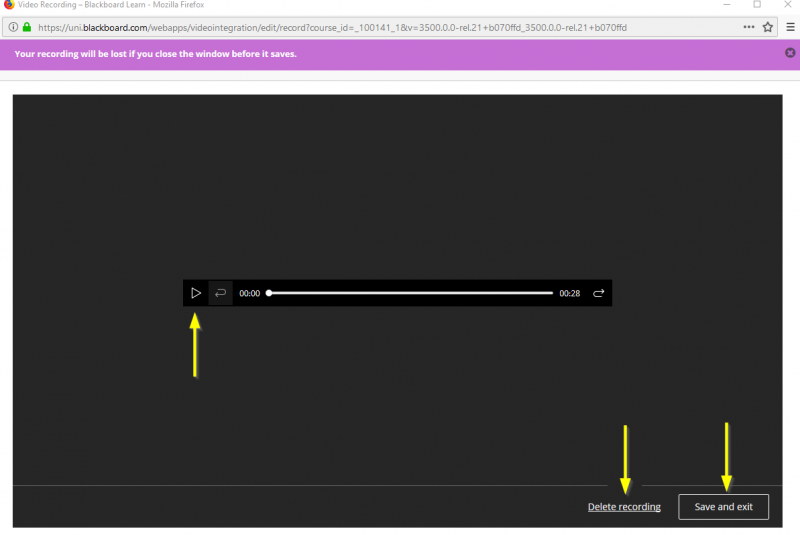 Next, click on the microphone icon to leave audio or video feedback. 5. 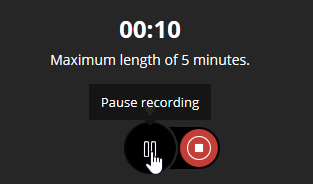 When you are ready to record, hit the red button (Note: you have a maximum of 5 minutes). 6. You may pause and resume the recording at any time. When you’re finished recording, click on the red “Stop” button. 7. From the next screen, you can listen to your audio/video recording. You can also choose to delete the recording and start over, or save and submit it. 8. If you choose to save your recording, it will ask you to provide a name for your recording (Note: the “Alternative Text” will automatically match the “Recording Name”). Click on “Insert Recording” when you are ready to continue. 9. 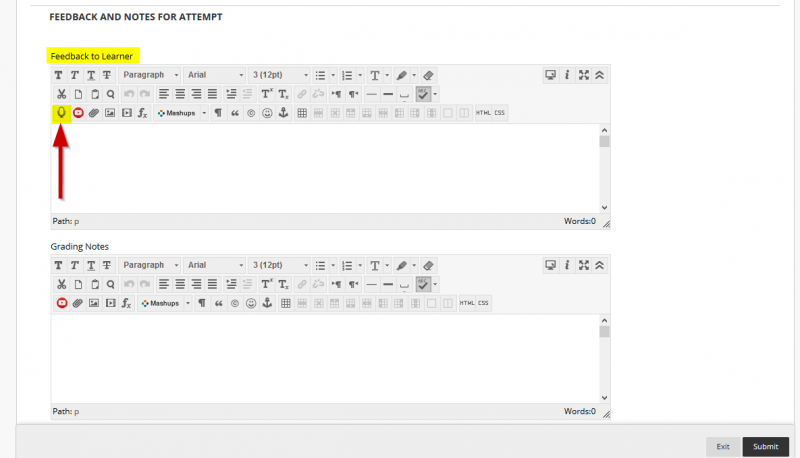 In the text editor, you will see a Audio Feedback icon appear. You can choose to add additional text if you would like. Click “Submit” when you are ready to continue. 10. You will then be brought back to the original grading screen. 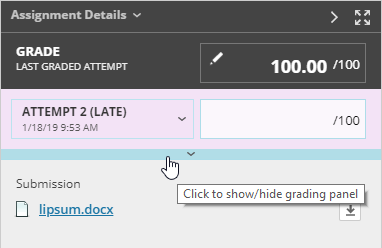 Click on the “Submit” button to submit the student’s grade. (Note: You may only provide audio/video feedback at the end of a test, not on individual questions). 1. Open a student’s test from "Needs Grading" or the "Full Grade Center". 3. In the “Feedback to Learner” text editor, you should see a microphone icon. Click on it to open the audio/video recorder. 4. 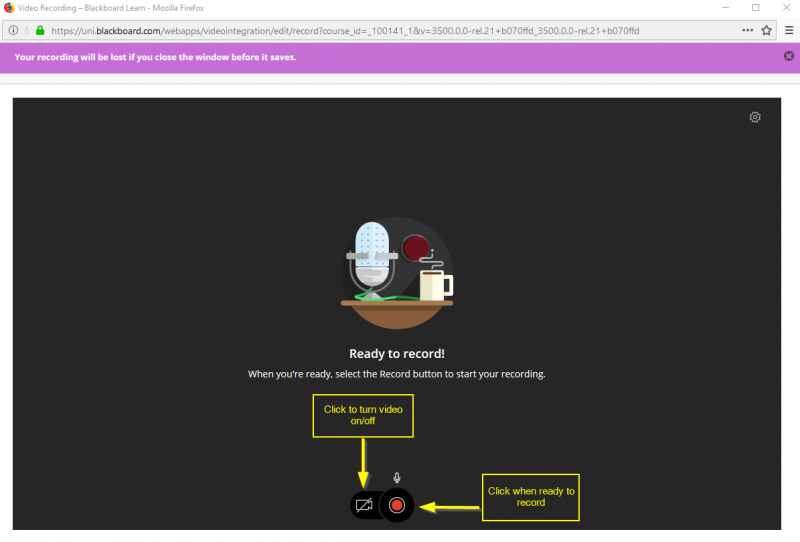 Follow steps 4-9 in the section above to record your video/audio feedback. 5. Click Submit when you are ready to submit the student’s grade.